Want to learn how to trade the spinning top and doji candlestick pattern? 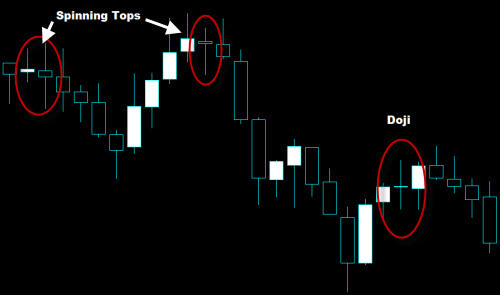 In this article, I will show you how to identify the spinning top and doji candlestick pattern, and how to trade them successfully. This article will be the first in a series of price action posts in which I will reveal to you guys everything that I’ve learned about trading price action candlestick patterns and other chart patterns. Doji candlesticks are those who’s opening and closing price is the same. They usually have relatively small upper and lower shadows, although there are exceptions. In the picture below, you can see some doji patterns. In the same picture, you will also notice some spinning tops. Spinning tops are similar to dojis, and in Forex they can be traded the same way. Spinning top candlesticks are those who’s opening and closing prices differ by only a few pips. They, like doji candles, also usually have relatively small upper and lower shadows. Many misinformed traders treat the spinning top or doji as a reversal pattern. The fact is that, although a doji or spinning top may often be followed by a reversal in price, the only thing it tells us for sure is that the market is unsure about what direction price should be going. In the example above, price did reverse each time; however, often a doji or spinning top candlestick pattern signifies that price is simply slowing down at a level of support or resistance. Price could always continue in the direction it was heading. The most important thing you should take from the lesson is that dojis and spinning tops signify neutrality in the market – not a reversal in price. Dojis and spinning tops can be used to prepare for a possible entry, and you can use them to note areas of support and resistance; however, you should never make a trade decision based on a doji formation or spinning top candlestick alone. As with a few other price action techniques that will be taught in this series, multiple occurrences of these two candlestick formations increase the odds of a reversal in price. Keep in mind that the market can do anything at any time. For more information about trading the doji, spinning top, and many other candlestick patterns, please check out Steve Nison. The majority of my knowledge in price action and candlestick patterns came from Steve. He is credited with introducing the western world to candlestick charts. He is THE expert on price action. I’ve also studied Nial Fuller’s price action course and a few others, but I highly recommend Steve Nison’s courses. I hope you see how trading the spinning top and doji candlestick pattern can be useful to you. Learning these price action techniques is a great way to profit in the Forex market, especially when combined with another profitable trading system. Check back soon to follow my full price action series, and read other great trading articles as well. Thanks for this. Looking forward to the next one. Glad you liked it. I’ve been busy with trading and other things lately, so it’s been hard to find time to work on the site. That being said, the newest article in my price action series is up. Hey, Don! Thanks for the kind words, and thanks for commenting. Will I be able to use this in 60sec trades? Hi, Lloyd. Technically, these candlestick signals will work on any time frame, however, I personally would not give too much credence to any signal that occurred on a time frame shorter than the 15-minute.